In our business this is considered 'forecasting suicide' but we have nothing to hide so we never hedge our forecasts. More importantly, we want to protect individual investors from buying into the current media hype generated by traditional stock analysts. Following the successful launch of the iPad, with sales that continue to beat many analyst predictions, Apple's stock prices soared to record highs this month and its market cap surpassed Microsoft's for the first time. However, BAM Investor, the first hedge fund financial model based on behavioral analysis, today announced publicly on Twitter that it predicts the share price of Apple (AAPL) to fall to $42 as soon as Fall 2010 or as late as Fall 2011. Last year, BAM Investor shocked the financial community by becoming the first and only institutional grade financial model to start sharing stock, currency and commodity market predictions publicly on Twitter and on national radio. While BAM Investor's model portfolio and most of its individual stock calls are normally reserved for institutional and hedge fund clients, the company decided last year to start sharing certain key predictions publicly on Twitter to help protect individual investors, who typically don't have access to the same complex financial models used by hedge funds. 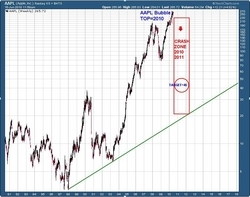 "As far as timing, our behavioral analysis model indicates AAPL could reach the 45 dollar level as early as the Summer/Fall of 2010 or as late as the Fall of 2011. I understand that this forecast will shock most investors--and for good reason. The cardinal rule of forecasting is to only predict price or time, but never both," said BAM Investor founder and CEO, J.G. Savoldi. "In our business this is considered 'forecasting suicide' but we have nothing to hide so we never hedge our forecasts. More importantly, we want to protect individual investors from buying into the current media hype generated by traditional stock analysts." Unlike traditional financial models which have difficulty during times of market volatility, BAM Investor uses a unique model called "Behavioral Analysis of Markets" or BAM, which is based on more than 20 years of quantitative analysis of how complex human behaviors and social movements affect stock prices. This unique model has enabled BAM to predict market prices with enormous precision--especially in times of extreme market volatility. Examining the flaws in traditional analysis, Savoldi explains: "Stock analysts always tend to assume an endless trajectory of success for a company once the company is on a 'roll.' They claim that stock prices are a reflection of future earnings when in reality the stock price is reflecting catalysts like short-covering, momentum investing based on chart technicals, and an extreme in investor optimism. History is littered with examples of analysts raising stock price targets into all-time highs just prior to a collapse. SUN Microsystems' stock traded up to a split adjusted price of 258 dollars before crashing into single-digits yet their CEO and many analysts were raising earnings estimates for future quarters and years as the stock crossed the 250 level." BAM Investor continues to fulfill its uncanny track record of recent "bubble crash" predictions which run contrary to traditional analysis. When POT (potash) was over 241 BAM predicted a crash to 48 and the stock crashed to 47.54. When HOV (Hovnanian) was trading over 70, BAM predicted a crash to 10 and it crashed to 1 dollar (hedge fund clients were told in advance to cover the short at 1.00). When SHLD (Sears Holdings) was trading at 195, BAM predicted a crash to 40 and it crashed to 27. Savoldi also offered insights into Apple based on Behavioral Analysis of Markets and how current social movements will affect stock price: "Nature has a distinct sequence of growth and destruction (think spring and winter) and I discovered this pattern in stock price movement. Once the sequence has completed a growth phase it is time for the destructive phase. AAPL is just the latest example of a stock that will trap investors blinded by greed. When the majority moves to one side of the boat, the boat will reach a tipping point sending the unsuspecting buyers tumbling overboard." Savoldi further explains that the Apple crash will be in conjunction with a larger overall stock market crash: "The extreme nature of the predicted crash for Apple probably has a lot to do with the current crash set up we have in the major market averages. In other words, although Apple is definitely a cult (bubble) stock, the 45 dollar target is also most likely a reflection of the massive crash we're expecting in the stock market as a whole." As a 20 year pioneer of behavioral analysis, founder J.G. Savoldi is frequently sought out by hedge funds and financial news media for his expert commentary on how irrational human behaviors affect prices of traded markets and how human behavioral analysis can be used to predict these market prices with extreme precision. To learn more about BAM Investor and behavioral analysis, visit: http://www.baminvestor.com. There you can register for free as a BAM Insider to receive early warning newsletters and live Twitter updates on key stock market indicators. For serious individual investors, BAM Investor also offers a Global Professional Program, which includes full access to its model portfolio and investor dashboard. BAM Investor is the world's first and only behavioral analysis model used to predict future movements in stock, commodity and currency markets. Originally focusing exclusively on hedge fund and institutional clients, BAMInvestor.com now provides a wealth of resources to individual investors aimed at targeting decisive investment and trading ideas based on the Behavioral Analysis Model. BAMInvestor.com also offers subscription access to a real-time portfolio making it easy for individual investors to monitor the exact Exchange Traded Funds (ETFs) contained in JG Savoldi's personal portfolio. Founder J.G. Savoldi is a twenty year pioneer in behavioral analysis modeling and is sought by the financial news media for his expert commentary on markets and how irrational human behaviors affect future price movement. Disclosure: BAM Investor is not a licensed broker, broker-dealer, market maker, investment banker, investment advisor, analyst or underwriter. Our discussions, analysis and predictions are derived by our interpretation of our proprietary model's readings, and should not be misconstrued as an investment recommendation or advice in any form. It should be clearly understood by anyone viewing this press release or related materials that investing in the stock market carries with it inherent risks and uncertainties. The actual results of a stock or commodity or currency could differ materially from descriptions given. There is a risk for substantial losses trading securities and commodities. Material and commentary provided is for information purposes only and should not be construed as an offer or solicitation of an offer to buy or sell any securities.